Seemingly only one point of sail.... downwind. Whether crossing the Atlantic from Boston, sailing northward up the east coast, sailing southward down the east coast, transiting around Cape Sable... all downwind. The initial prevailing south-westerlies decided to shift to a much less common northeasterly as if the wind was taunting and following us wherever we ventured. Probably more picturesque than I was able to appreciate but fog cloaked the treasures. Visited Shelburne, Lunenburg, Prince Harbor (opposite side of Lunenburg in Mahone Bay), Lockeport; did not make it to Halifax. Shelburne was a welcoming first port of call; very much enjoyed exploring Lunenburg by foot; highly recommended. Transited tricky Cape Sable successfully - check. Very happy that we ventured here; tackled some challenging sailing honing our skills. Tethered in on the bow dressed in full weather foulies and PFD listening and looking out for traffic in the fog. 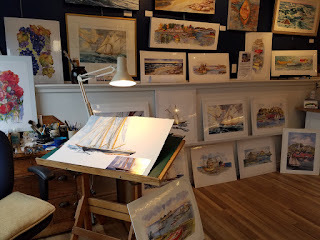 Sailing to and exploring Nova Scotia was like Brussels sprouts... good for us; sturdy and intricate; helped us be better, stronger sailors; there are plenty of places I have enjoyed more and it was most certainly never "wine and cheese" sailing but rather a tremendous amount of work and attention. Note: I actually like Brussels sprouts but had difficulty thinking of a vegetable I did not like. You get the point. Why have we waited so long to explore mid and northern Maine coast?!? Love it by sea and land. Acadia is a treasure. I will never complain about the amount of lobster pots in Marblehead.... it is like a maze to navigate through the farms of pot markers in these waters. More to come on Maine with the next post. 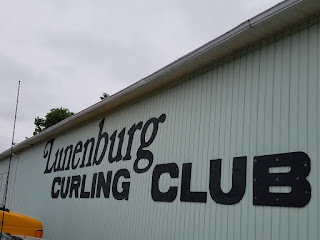 Upon arriving in Shelburne, NS from Boston, we had planned to stay for two nights to sprinkle in some much needed rest and relaxation, but instead departed in the evening of day 2 to tackle a long overnight trip northward up the coast. (We craved more healthy, crunchy, green vegetables.) The wind had been blowing us hard across our beam all day in Shelburne pushing us tight against the dock, but then politely lightened up as we were preparing to send off for the 80nm journey to even higher latitudes. 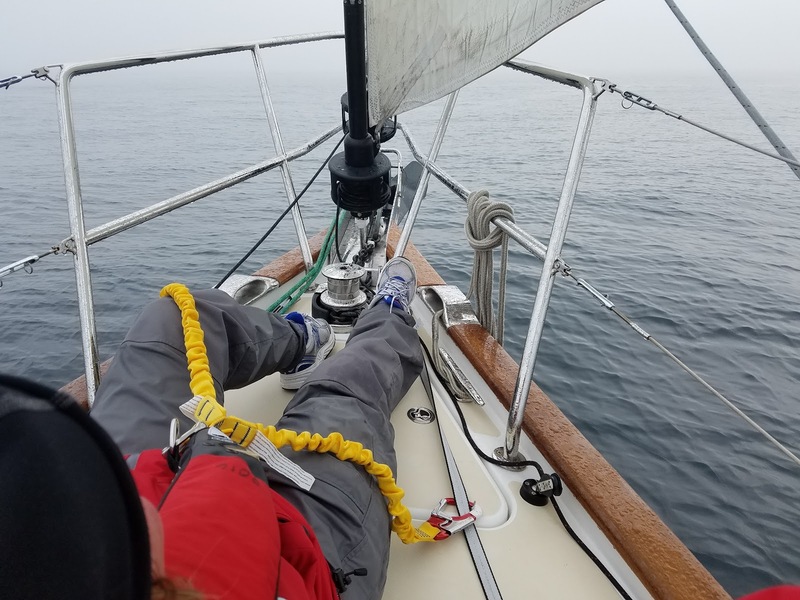 It was a long, eery sail overnight in the fog with both of us on high alert listening for traffic and continually examining the radar zoomed in, then out. I was thankful for the relatively light winds although disappointed that the wind was still on our back. The scarcity of any traffic was welcome but I kept questioning if it could really be that deserted... Was our radar working? Was our AIS working? Where were the other vessels? Some sea birds, Terns of some species perhaps, were attracted to our navigation lights and would swoop and squawk by us revealing only a fleeting peak through the thick fog as they flew around us. We could hear them but not see them until they started landing on the foredeck and even one in the cockpit. It was kind of creepy and I tried not to think of the Hitchcock movie. Daybreak brought some welcome brief glimpses of an attractive coastline. Little did we know this would be about all the coastline we would see for the rest of our days here. 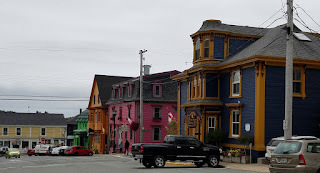 Lunenburg is a picturesque yet authentic coastal town. The buildings are mostly from the 1800's and early 1900's and retain their historical beauty. I got to explore the town while Bob stayed on Argon writing code. Dan take note. Lunenburg is a true working town with a lively fishing and boating industry. 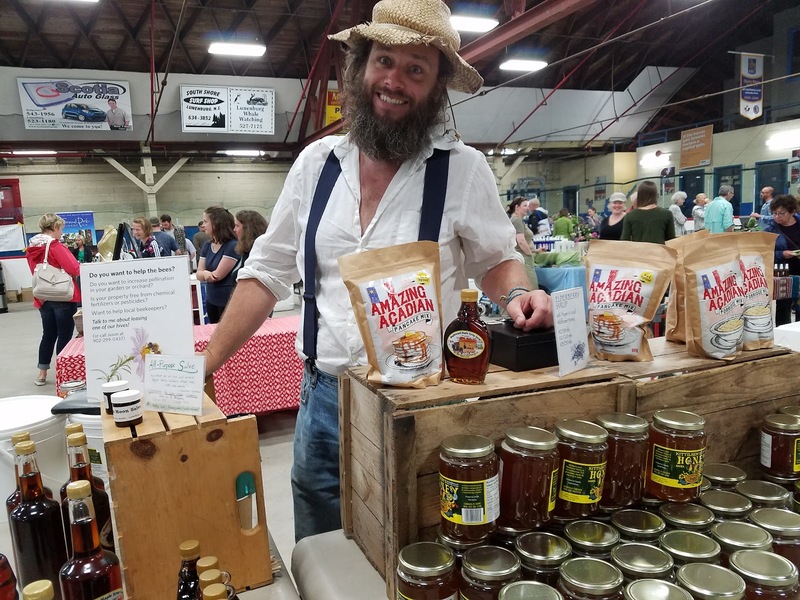 In order to compensate for the contracting fishing commerce, Lunenburg made a conscious effort to grow its tourism industry over the past decade or two to prevent it from succumbing to economic disaster that has afflicted many coastal fishing towns. Although filled with shops and art galleries popular with tourists, Lunenburg lacks the sometimes artificial, sterile quality of many towns that have converted to tourism. While beautiful, Lunenburg is also salty and genuine with abundant construction and working life activity. 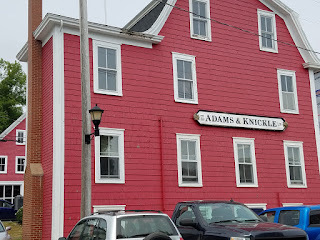 The couple of days in Lunenburg were my favorite of the Nova Scotia leg of this trip. Although filled with shops and art galleries popular with tourists, Lunenburg lacks the sometimes artificial, sterile quality of many towns that have converted to tourism. While beautiful, Lunenburg is also salty and genuine with abundant construction and working life activity. Adam and Knickle Ltd. Fishing company was established in the late 1800's and is a mainstay of Lunenburg. The company is owned and operated by the third generation of the two original families, currently with a woman running the operations which is unusual for a fishing company. Originally focused on salt cod, Adam and Knickle shifted to scallop fishing in the mid 1900's. We spent two nights docked next to the Maude Adams. This 49 Meter vessel was originally commissioned in 2003 but only recently purchased by Adam and Knickle and had a major refit doen in Spain. Maude Adams is one of three scallop boats for the company and is by far the largest and most modern. In addition to catching and processing the scallops, she has the capacity to individually freeze the scallops immediately which the company is touting as optimal for the scallops that will be shipped further away. 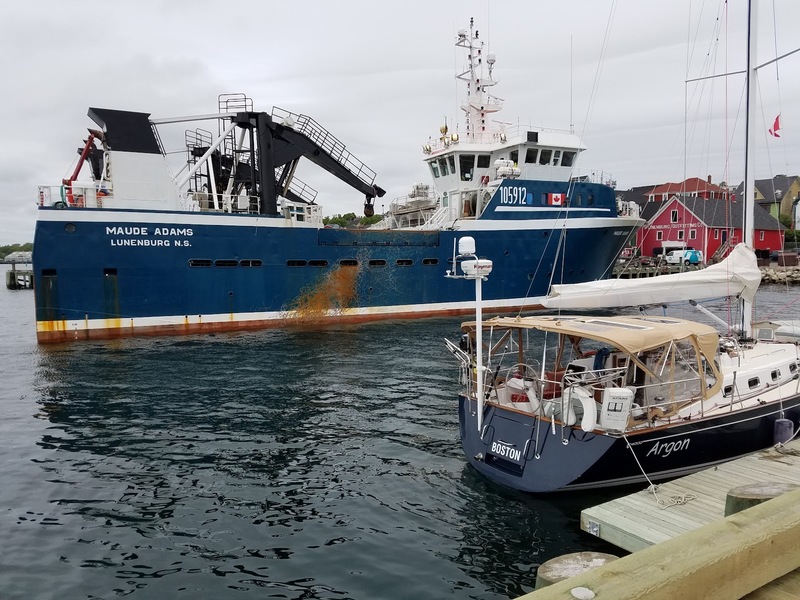 The Maude Adams was scheduled to depart on its first scallop run for Adam and Knickle the following week and will be at sea for about 14 days. When these big scallop boats return to port with dozens of young, recently generously paid and thirsty young (mostly) men, the town apparently gets a bit raucous. 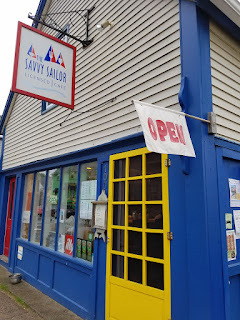 Savy Sailor: Settled in for a glass of red wine and cup of haddock chowder overlooking the lovely cloudy and rainy Lunenburg Harbor while I studied charts and cruising guides to figure out options for our next ports before leaving Nova Scotia for the states. The friendly hostess at the Savy Sailor placed me specifically at Table 23 since this is the spot where the free town WiFi seems to be the most reliable. Thank you! Fishermen's Memorial: During the peak of the fishing industry, Lunenburg harbor was dotted with hundreds of fishing vessels. In the early part of the century, prior to sophisticated navigation aids and meteorology data, accidents and deaths at sea were common. Since the early 1900's, more than 600 men and 150 ships have that have sailed out of Lunenburg have perished in the North Atlantic. Forty of the sunken ships lost everyone on board. 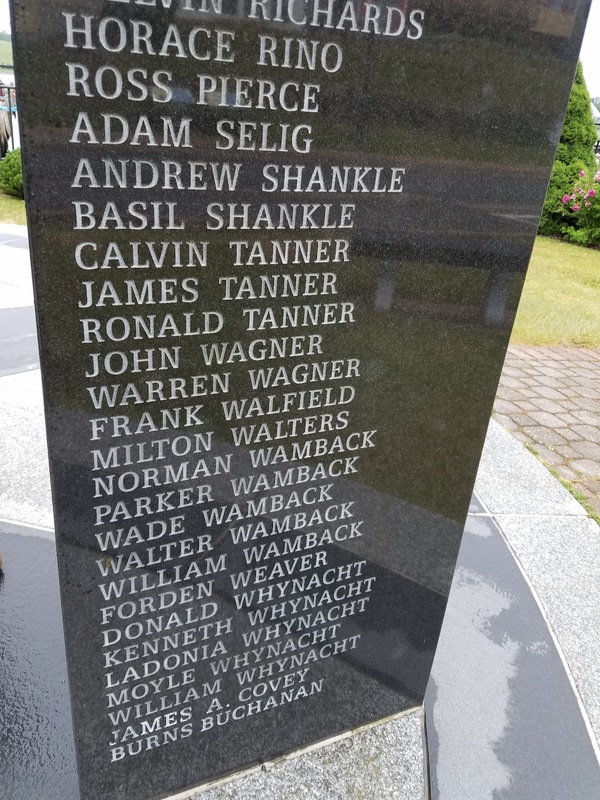 There are particularly numerous names listed under 1926 and 1927 -- 130 men died at sea in these two seasons due to being caught in unexpected early season gales in August both years. Notice that there are many of the same surname. Some families lost all of their bread winners and were not only emotionally devastated, but economically ruined. After 1927, no more than one man per family was allowed out at sea on the same ship. 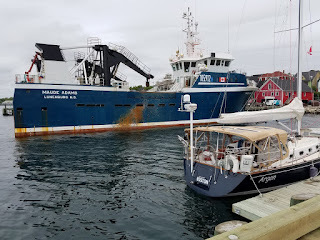 After a couple of nights in Lunenberg, we did a short 15nm sail out in to Mahone Bay venturing up the very well protected Prince Harbor in to a very secluded anchorage which was only a couple of miles from where we had been docked prior. We anchored comfortably for the night in Prince Harbor is just on the north side of Lunenburg near Lunenburg Yacht Club. Another Challenging Sail - Ugh! We set our alarms for 0430 the next morning to begin a long trek southward to Lockeport. We had anticipated a tough downwind sail with potentially large seas and our expectations were met during this extremely challenging 16 hour sail, one of our top 5 most challenging trips ever. In addition to being cold, cloudy, misty and somewhat foggy... this was the fourth day of north/northeasterly winds bringing the North Atlantic gushing down the eastern coast of Nova Scotia. We spent an exhausting day of active steering downwind with 6-10 (and some 12) foot following seas. Btw... It is common for people to wish us well by stating "may the wind be at your back". Although well-meaning, sailors generally do not like the wind at their back (unless consistent, light and accompanied by flat seas). But high winds at our back create large seas and it is quite challenging to handle the boat and avoid gybing. 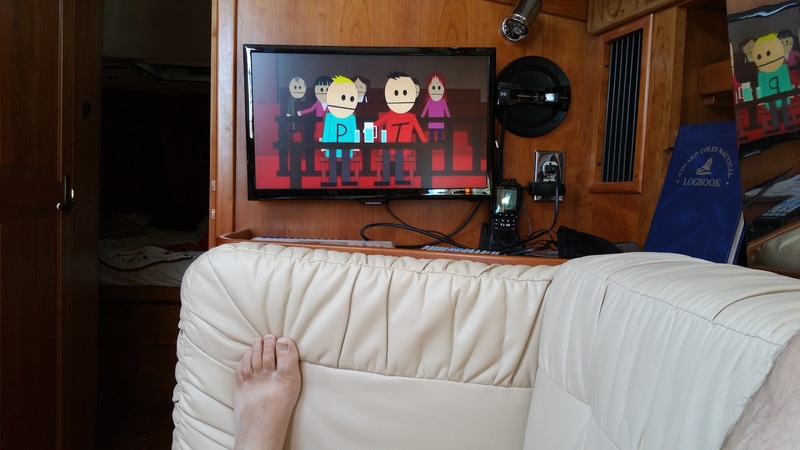 A better tiding would be to wish us winds across our beam.... or, perpendicular to the boat... But I have yet to hear a pleasant, sing songy phrase that wishes perpendicular breeze or a beam reach.? Suggestions welcome! Rude Awakening: I made the mistake of resting on the windward cockpit bench as it was a bit warmer (well, less cold) when a particularly aggressive wave came upon our port quarter and bumped me violently up and off; I hit my head and shin quite hard resulting in a couple new bumps and bruises. 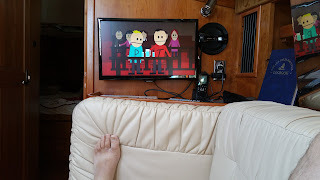 Bob administered a cognition test (I was still about as smart), I took some ibuprofen, and then moved to the leeward side while Bob continued steering. The Elusive Coastline: I suspect that the Nova Scotia coast is beautiful, but alas, we did not see much of it despite more than 200nm of sailing up and down the east coast. The depth of solitude of the coastline was surprising... where were all the pleasure boats in peak season? What about all the fishing and commercial vessels? Was everyone in port (except us) because the conditions were awful? Even when we were sailing within 10nm of the coast.... rarely a boat in sight not only when it was foggy but even with decent visibility. Even on AIS and radar... where was everyone? Had the weather been clear, I probably would have relished in the solitude a bit more. However, when having to rely on instruments, it was a bit odd. Perhaps I have been a city dweller too long and overly accustomed to the Boston area sea traffic. I was very happy to finally be nearing our evening destination. After negotiating a rocky and narrow channel in the early evening, we did a messy docking along the empty tie up in continued high winds in Lockeport. Lockeport is a fairly bland little harbor with several lobster and fishing boats but seemingly no pleasure craft or ambition to be an attractive port. It felt like a ghost harbor and certainly did not have the activity expected of early July. We settled in for a restful evening and prepared for another early morning departure. Our next transit would be a long haul initially southward around Cape Sable, northwest across the southern section of the Bay of Fundy, then westward skimming the Gulf of Maine back to the US. 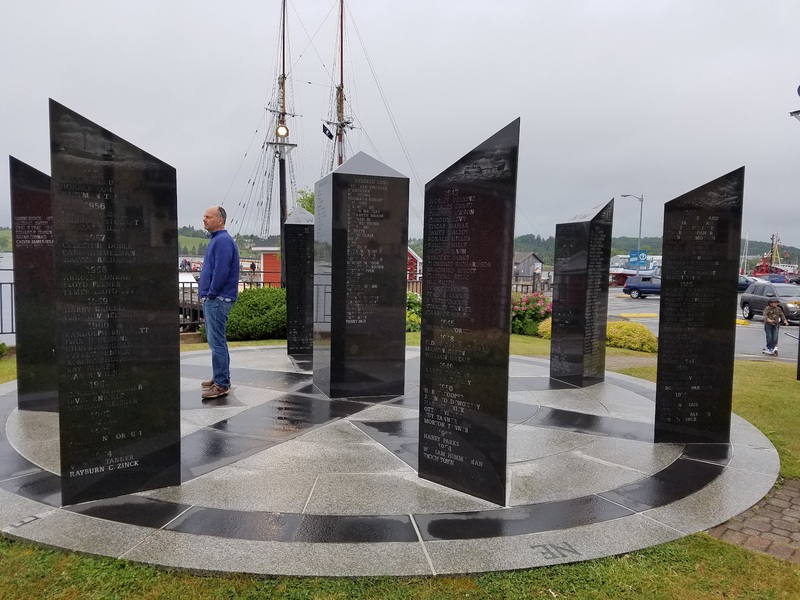 Ken McKinley from Locus Weather was in communication with us about the return crossing and suggested that Sunday would be a good day to depart for Maine. His prediction was that we would have ENE winds but they would slowly back to the Northwest. His suggestion was to leave as early on Sunday as possible (even though the weather would be rainy and chilly) in order to get as much of the trip done before the winds turned on our nose. After examining charts and tides, we set on another early morning departure to ensure we would round the Cape with the current. We departed again in the fog focusing intently on the navigational markers, chart, and GPS to avoid the plentiful rocky shallows in the windy early morning hours. 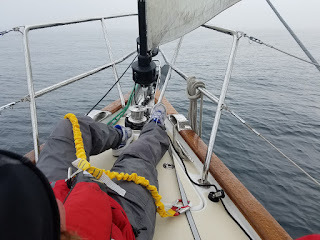 Although the northeast winds continued, the seas where much more manageable compared to the prior day as we mentally prepared ourselves for the approximately 36 hour sail to Maine. Rounding Cape Sable at the southern most tip of Nova Scotia needs to be approached with planning and caution. The currents run strong, up to 4 kts!, and one should definitely avoid wind opposing current which can churn up the seas substantially in the fairly shallow waters. We timed our arrival to grab the front side of a favorable current and were able to ride this in modest winds for about 30 miles. As we rounded Cape Sable, the winds were not really showing any signs of backing to the N or NW yet and we were making very good time. We were able to perfectly time a slack tide in a variable but comfortable 15kt wind as we pointed about 300 degrees to thread our way south of Mud Island and north of Seal Island before entering the Bay of Fundy. We were briefly startled when a seemingly fishing vessel crossing our path abruptly changed course heading straight for us. It soon became apparent that it was some sort of tourist boat (very odd given the complete lack of any traffic whatsoever) and the passengers were excitedly taking photos of us. Perhaps they were excited to see another boat out on the vast waters. They passed close enough for us to exchange good mornings across the misty water. Just after passing between Mud and Seal Islands, we noticed the promised backing of the wind to the North. Suddenly, we had switched from sailing very low off the wind to sailing very high. We decided to "put some in the bank" and aimed slightly north of Bar Harbor. The current in Bay of Fundy can also be quite strong and goes hand in hand with huge tidal swings along the western cost of Nova Scotia up to 26+ feet! We knew that our favorable current would be changing and slowing us down as we crossed the southern Fundy and in to the Gulf of Maine. I welcomed the refreshingly flat seas and... we were not sailing downwind!! Instead, we were close hauled and still leaving our ultimate Maine destination to be determined by the wind. Customs check in limited us to Portland, Camden, or Bar Harbor and we eventually targeted the northernmost of these choices as we beat in to a modest north then northwesterly wind able to average about 5kts against the current. It was decadent to sail overnight with clear skies and flat seas!! The AIS remained eerily sparse with only a handful of fishing boats and a couple of tankers detected all night. Morning brought a beautiful sunrise but also a shifting wind, as expected. We continued to sail high but eventually had to fire up the diesel and motor the remaining 30nm in to a headwind. The first glimpses of Mount Desert Island were originally mistook for low clouds hugging the horizon. But no, this was the 1500 ft elevation of Acadia National Park. Maine has been an unexpected delight. 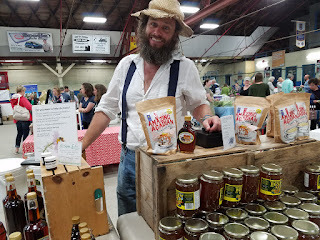 Although I have lived in New England most of my adult life, I have been acutely aware that my Maine exposure has been scant. We know of Maine being a sailing destination of course, but other than Portland, we have not explored the northeastern coast. But boy, do I get it now! From the first far away glimpses of Mount Desert Island, to weaving around dozens of rocky islands, anchoring in secluded harbors, and visiting coastal towns... More to come on my love affair with Maine. Fascinating story. We have explored some of those areas, only from the vantage point of a nice "safe" and comfy car. I hope you managed to get to the top of Caddlac Mountain.